When I do an initial assessment with a client I often times find that they or their caregivers are concerned about medications. Whether it’s remembering to take their medication or becoming overwhelmed trying to remember if they already took it, it can be tricky for many seniors. I’ve decided to list a few tried and true systems for medication management that I’ve had clients use that worked for them. Which system a senior can or should use will be based on their individual cognitive and physical abilities. A Medication Planner: A medication planner is a box for pills that are separated by the day of the week. 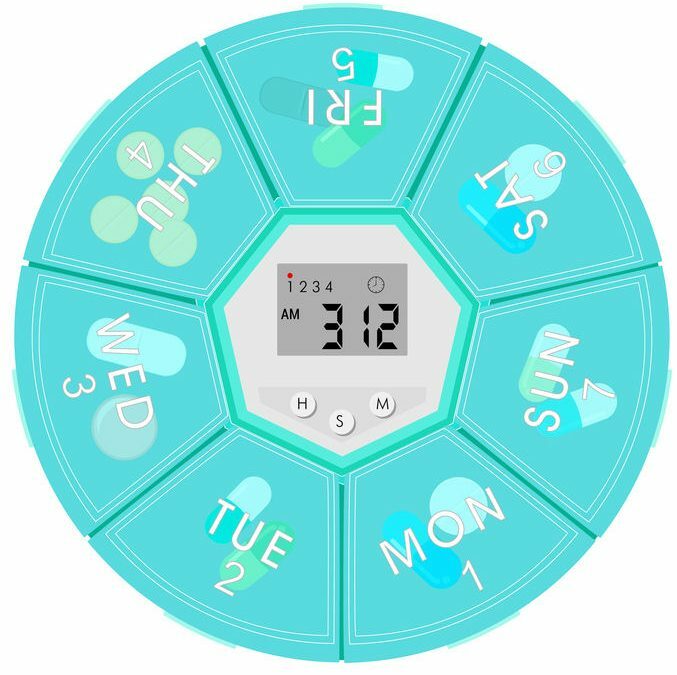 You can even get ones divided into morning and night or ones that have up to four different boxes each day of the week for those who take medication many different times of the day. When a senior is first starting to have a little trouble remembering if they took their medication, this is a great alternative to opening individual bottles. Often, seniors fill their own planners, but the use of these boxes can be extended by having a caregiver of some sort fill them for the senior. Pre-Packaged Bubble Packs: These nifty packages come straight from your local pharmacy. Not all pharmacies can fill your medication this way, so you must shop around to find out who can. The pharmacist will package all medications that should be taken at certain times of the day together in a small disposable bubble. The bubbles are usually labeled on the backside with the name/s of the medications, which date they should be taken, and what time of day. The senior must still be able to remember to take the medications for this to work. Small timed medication dispensers: These can be purchased from many stores and online. The amount of days the dispenser can be pre-filled often depends on the number of doses one takes in a day, as well as which dispenser you purchase. These dispensers are great for people who may be known to either forget to, or over take their medications, as it will alert them when to take the meds, but will not allow the patient to access the medication early. Large Medication dispensers connected to a phone line: These dispensers are usually purchased through safety alert companies and can actually alert a senior when to take their medication as well as let a loved one know if a dose has been missed. The machine is connected to a home phone system which is how it sends the message that the medication was not picked up, alerting someone to check on the senior. There is usually a monthly fee with this type of dispenser. These four ideas of helping seniors continue to take their medications independently can be both financially and time advantageous for both the senior and caregiver, however it is important to closely monitor whether the senior is still able to take their medications with this type of assistance. Once they show signs of missing doses, or are unable to take them out of the boxes or machines, it may be time to switch to the next dispenser option or bring in human assistance to confirm that they continue to appropriately take their medication.